Patience is a virtue, and I can certainly justify the meaning of that statement. Just 10 months prior to capturing this colorful July sunset I had no luck with the September conditions here in Rocky Mountain National Park at the Rock Cut. I was plagued by lifeless, cloudless skies and decided it was best to part ways with those files. Fortunately, July of 2016 would find me joyfully celebrating sensational conditions at sunset. As I waited for the conditions to just explode with color, I could glimpse out at the Forest Canyon and observe countless Elk grazing in the alpine meadows. 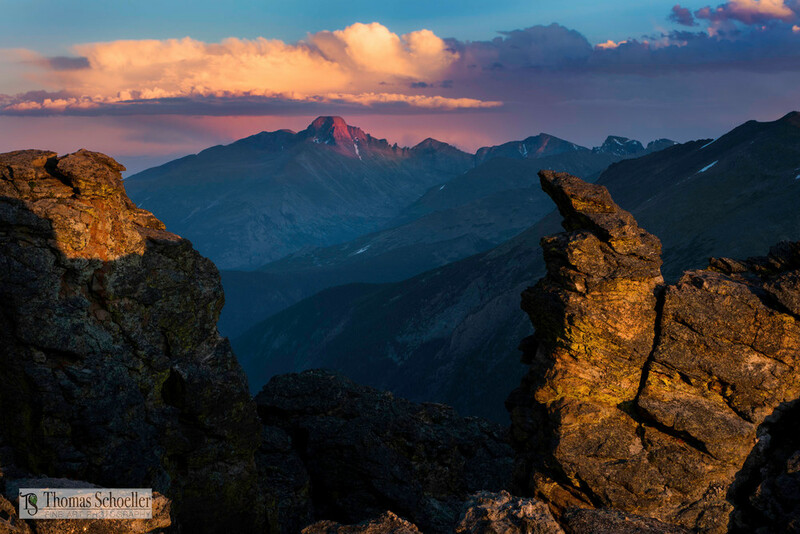 The diamond shaped high peak that dominates the distant mountain range is Long's Peak, the highest elevation in RMNP. The natural window I used as the foreground to frame this scene is part pf the Rock Cut, the narrow formation just to the right is called the Thumb. This is a highly detailed scene and is available in sizes up to 60x40". Ordering a print only is the most affordable way to purchase this print and allows you freedom to pick your own matting and frame style. If you're looking to purchase a superb fine art gallery presentation, the Acrylic Print option is highly recommended! *Please Note** the watermarks visible on my website are never transferred to the prints that are shipped to my clients.